Who should not take Cipro? This antibiotic treats only bacterial infections. It will not work for virus infections (such as common cold, flu). Unnecessary use or misuse of any antibiotic can lead to its decreased effectiveness. What conditions does Cipro treat? Tell your doctor right away if you have any serious side effects, including: unusual bruising/bleeding, signs of a new infection (such as new/persistent fever, persistent sore throat), signs of kidney problems (such as change in the amount of urine, red/pink urine), signs of liver problems (such as unusual tiredness, stomach/abdominal pain, persistent nausea/vomiting, yellowing eyes/skin, dark urine). Get medical help right away if you have any very serious side effects, including: severe dizziness, fainting, fast/irregular heartbeat. List Cipro side effects by likelihood and severity. Before using this medication, tell your doctor or pharmacist your medical history, especially of: diabetes, heart problems (such as recent heart attack), joint/tendon problems (such as tendonitis, bursitis), kidney disease, liver disease, mental/mood disorders (such as depression), myasthenia gravis, nerve problems (such as peripheral neuropathy), seizures, conditions that increase your risk of seizures (such as brain/head injury, brain tumors, cerebral atherosclerosis). The risk of QT prolongation may be increased if you have certain medical conditions or are taking other drugs that may cause QT prolongation. Before using ciprofloxacin, tell your doctor or pharmacist of all the drugs you take and if you have any of the following conditions: certain heart problems (heart failure, slow heartbeat, QT prolongation in the EKG), family history of certain heart problems (QT prolongation in the EKG, sudden cardiac death). Older adults may be more sensitive to the side effects of this drug, especially tendon problems (especially if they are also taking corticosteroids such as prednisone or hydrocortisone) and QT prolongation (see above). What should I know regarding pregnancy, nursing and administering Cipro to children or the elderly? Some products that may interact with this drug include: "blood thinners" (such as acenocoumarol, warfarin), strontium. Does Cipro interact with other medications? Should I avoid certain foods while taking Cipro? 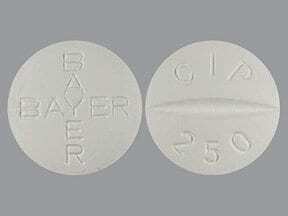 This medicine is a slightly yellow, round, film-coated, tablet imprinted with "BAYER BAYER" and "CIP 250". 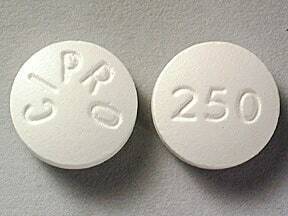 This medicine is a slightly yellow, round, film-coated, tablet imprinted with "CIPRO" and "250". 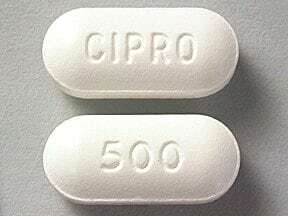 This medicine is a slightly yellow, oblong, film-coated, tablet imprinted with "CIPRO" and "500". Are you considering switching to Cipro? How long have you been taking Cipro?